Does not increase the chance of a crash. Increases your ability to react to a hazard. Often leads to high-risk decision-making. You are not allowed to pass in this area. You are in a passing zone and it is safe for you to pass other vehicles on the left if no oncoming traffic is present. You are only allowed to make right turns in this area. When there is a solid yellow line and a broken yellow line in the center of the road, passing is permitted from the side of the road next to the broken line. Construction and maintenance warning signs. 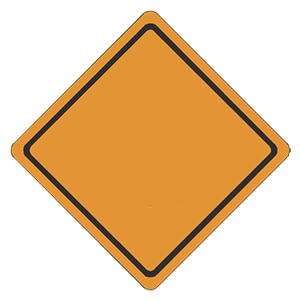 The color orange is used only for construction and maintenance warning signs. Change in direction or narrowing of roadway. This sign warns a driver of a change in direction or a narrowing of the road. 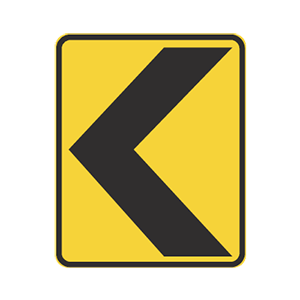 A driver may find several of these signs on the outside of a sharp curve or on approaches to a narrow bridge. Assume all drivers automatically obey the right-of-way rules. Assume most drivers obey the right-of-way rules. Always be prepared to yield the right-of-way. Although the right-of-way rules provide a guide to determine who should yield the right-of-way at an intersection, no one should assume they automatically have the right-of-way. The situation and circumstances at an intersection must always be considered. Drivers should yield their legal right-of-way if it can help prevent a collision.